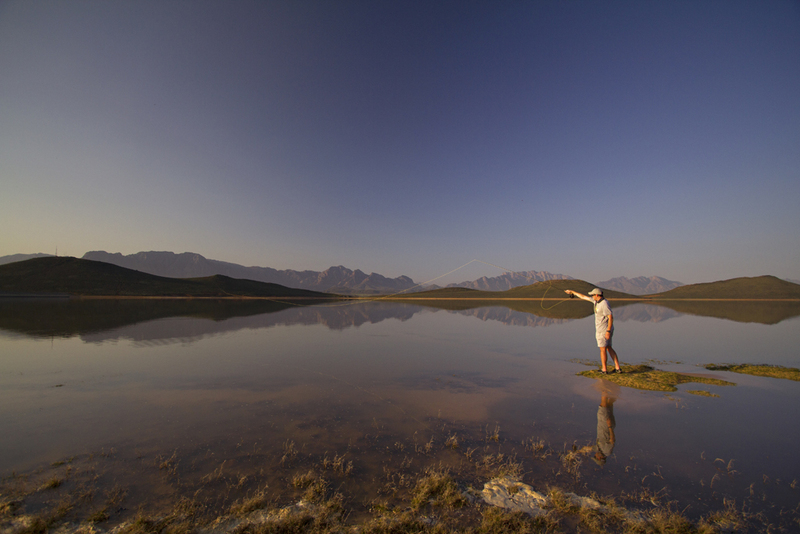 Above: Russell De La Harpe casting a Falloon into the vast Brandvlei. The Falloon can be used on a fly rod to cover more water – the small split shot we pinched to the line above the Sada grubs didn’t add enough weight to the rig to reach long casting distances, even with 2 lb line; however, the Falloon can be cast the distance of a full fly line (approx. 100 ft). The tungsten bead on the hook of the Falloon gives the fly a different action compared to split shot pinched to the line a few inches above the hook and this works particularly well to sink the fly to the substrate quickly where fish like carp, catfish, yellowfish, bass etc. feed. 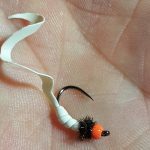 The front-weighted Falloon then also has a jigging action which is a trigger for many fish species to eat it – and it gives the curly tail a lovely kicking movement. The Falloon is also tied on a scud-type hook (or caddis wetfly hook) which makes it swim hook-tip facing upwards and snags less often than a trailing Sada grub. A hotspot bead, like the classic orange tungsten bead, can be added to the Falloon, which can aid as another trigger for fish that respond well to fluorescent orange, and so on. ‘Muddies’ seem to like Falloons. Smallmouth yellows are suckers for many flies, including Falloons. 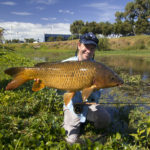 Utilising these advantages, I’ve managed to catch carp, smallmouth yellowfish, mudfish and catfish in the last three months. What made the Falloon very special to me was that I deliberately caught carp a fair distance from the bank by fishing blind in murky water. This was the first time that I’ve ever managed to pull that off and it certainly breached some boundaries in my fly fishing career. Furthermore, I caught smallmouth yellowfish and mudfish by fishing Falloons in the slower, deeper parts of the Orange River. It was also a first time for me seeing mudfish actively chase and take a fly in mid-water. Richard Stanford was so kind to share his successes with the Falloon and sent us photos of Awaka and Angara, characins that he caught on the fly below Murchison Falls in the Nile. Richard told me that they usually catch these fishes on baited hooks, but the fly grafted in his opinion. …And an Angara that he also recently caught on Falloons. Cat and carp on Falloons – they may be juveniles, but that’s better than catching nothing from the bank. Falloon catch reports will be updated as time passes and new species are caught on the fly. An oldie. But a goodie. Good on Richard for getting those fish despite having bananas onboard. imagine his success if he tossed them!